Manufacturer of a wide range of products which include hbl genset battery and exide xpress 12v 180ah genset battery. The Pure Lead-Tin VRLA battery has an unmatched peak power performance due to its thin plate design. This is a sealed maintenance free battery with no topping up required for life. The sophisticated SMPS battery charger with in-built protection ensures optimum charging of the batteries always. The periodic running of the Genset to charge the battery is therefore eliminated. 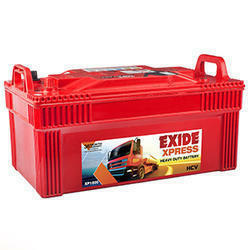 his Exide XP1800 180 AH Battery is specifically designed for commercial vehicles and diesel genets. The Exide XP1800 is based on heavy duty pasted plate technology and ensures that, it is ready to use once the packing is open. 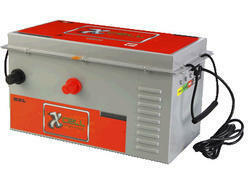 Exide manufactures quality batteries for inverters and UPS backups and this model can be said as one of the best ones. This Exide battery is available in a capacity range of 180Ah. This unit is available with special Hybrid Alloy System and can withstand Indian environments and high under-bonnet temperatures and thus perfect for commercial vehicles. The automotive battery is designed with Double-clad separation in the form of a special rib-free separator. Fortified with glass mat of a special texture, it actively supports the material thereby improving life of the battery in long run and absorbing resistance to bumpy road conditions and vibrations. This 12 volt battery comes in unique tree radial grid design; lower internal resistance and special paste chemistry enhancing, recharging capability of the battery during use. The lead acid battery is designed with magic eye which helps to ascertain the state of the charge as well as electrolyte level of the battery. The vehicle battery comes with Micro-porous filter disc in vent openings helping arrest, acid fumes and restricting spark propagation inside the battery. Its leak resistant design is further supported by a side vented lid with electrolyte flow back system which reduces chances of electrolyte leakage during handling. The car battery requires topping up only once in 6 months that makes it quite economical as well. Its special alloy ensures low water loss during high temperature operations. This Exide XP1800 180 AH Battery is delivered in completely factory-charged, ready-to-use condition. This battery is fast- charging and maintenance free. It has a pro rata 36 month warranty. Looking for Generator Battery ?